On July 11, 2010, about 1000 miles northeast of New Zealand, the moon’s shadow began its race across the South Pacific Ocean. In the early morning hours local time, the umbra passed over the island of Mangaia (aka Auau Enua) southernmost in the Cook Islands. Unfortunately, clouds moved in during totality. 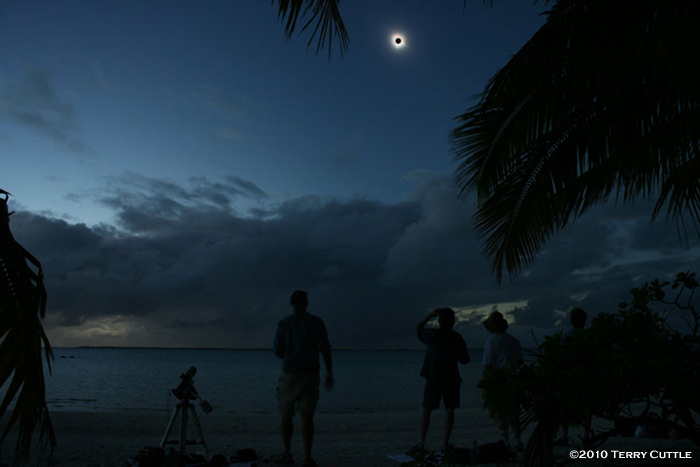 A partial eclipse was witnessed from Papeete, Tahiti with 98.8% of the sun covered by the moon. Bora Bora experienced a 93.7% partial phase. The Aremiti ferry transported about 500 passengers south of Tahiti to view totality. A few individuals sailed south in private yachts and chartered catamarans. Also south of Tahiti, the MS Paul Gauguin ship’s approx. 330 passengers along with 200 crew members witnessed about 4 minutes, 5 seconds of totality. A special chartered flight named “EFlight” embarked out of Papeete, Tahiti. Above the clouds and flying with the moon’s umbra, passengers experienced an incredible 9 minutes 23 seconds of Totality. The eclipse track continued east over several atolls in the Tuamotu archipelagos (Amanu, Anaa, Hao, Haraiki, Hikueru, Marokau, Marutea Nord, Motutunga, Nihiru, Pukapuka, Ravahere, Reitoru, Rekareka, Tatakoto, Tauere and Tekokota) All these islands experienced Totality. Tour operators offered private air charters to the few islands with airstrips. The Aranui 3 freighter was position south of Reitoru Atoll near Hikueru and Marokau. 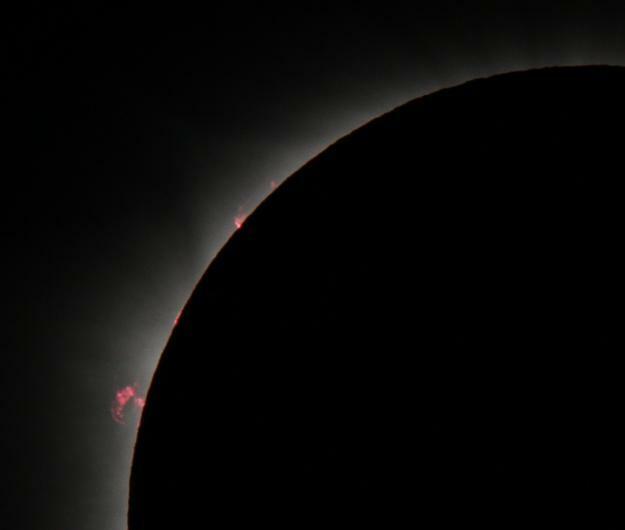 Don Gardner photographed solar prominences from Hao Atoll (about 550 miles east of Tahiti) Photo details: Canon 7D with Takahashi FSQ-106ED, ISO 400. In the early afternoon local time, the sun began to slip behind the moon directly over Easter Island (aka Rapa Nui, Isla de Pascua, Ile de Pâques). Broken clouds plagued some photographers. 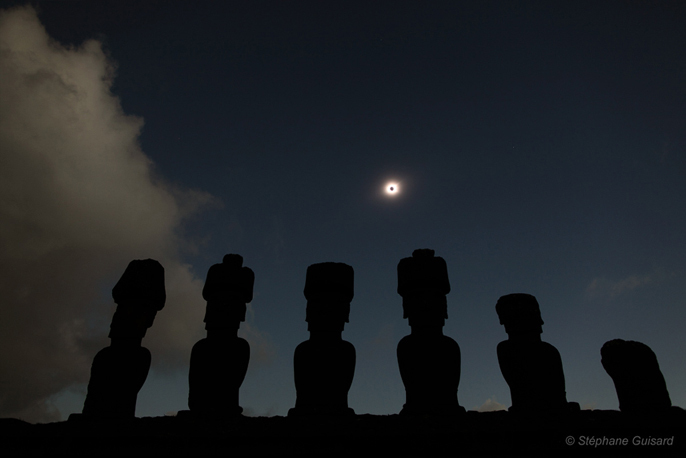 On Easter Island, totality lasted 4 minutes and 39 seconds with the sun and moon approx. 40 degrees above the horizon. The umbral track ended over Chile and Argentina at sunset. In El Calafate, Argentina the sun and moon were just a few degrees above the horizon creating a spectacular golden corona and dramatic lunar shadow over the Andes.